The year progresses with varying recoveries and lapses in van Gogh's mental state. 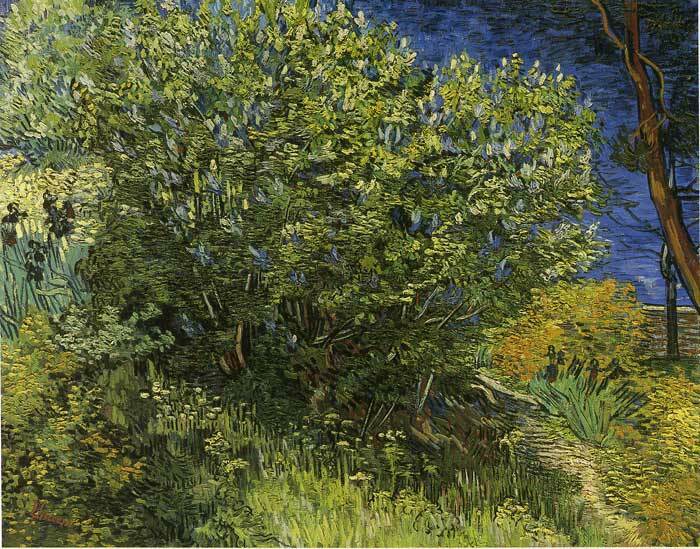 When able, van Gogh continues his paintings of landscapes (his famous series of olive groves, lilac bush and cypresses) from the asylum, but is forced to stop when his attacks (in which he tries to poison himself by swallowing his own paints) return. Since these attacks often occur while Vincent van Gogh is outdoors, he confines himself indoors and begins to do a series paintings based on the oil paintings of other artists van Gogh admires (specifically Millet and Delacroix). SPECIAL NOTE : The painter will make the reproduction as close to the original oil painting as possible. If you want your painting to alter from this likeness, please email us and " Lilac Bush, 1889 " will be reproduced according to your special requirements.